As the warmer months come in, it gets easier to check out homes that are for sale. This ease makes me more eager to step up my game as a trusted Realtor. I want to make sure that I’m providing my clients - valued clients like you - the best professional service possible. Not just when I help you buy or sell a home, but also with the service that I provide in between those transactions. You see, my business is built on repeat business and more importantly, referrals from satisfied clients. That’s one of the many reasons why I work hard to be of service to you month after month and year after year. As a valued client, your opinions matter a lot to me. This is why I would like to ask you a big favor. It would mean a lot to me if you contact me and let me know of any steps that I can take to make sure that you enjoy your home to the fullest. Whether it be answering your questions about real estate, giving you a visit to give you an idea of what your home is currently worth in today’s market, or maybe recommending a trusted professional to help you out with your latest project. Feel free to let me know of any way that I can help. Clients like you are the most important and the most rewarding part of my job, and I want nothing more than to make sure that you are treated that way. Sales are up in three of the four categories with townhome sales increasing to a whopping 40%. 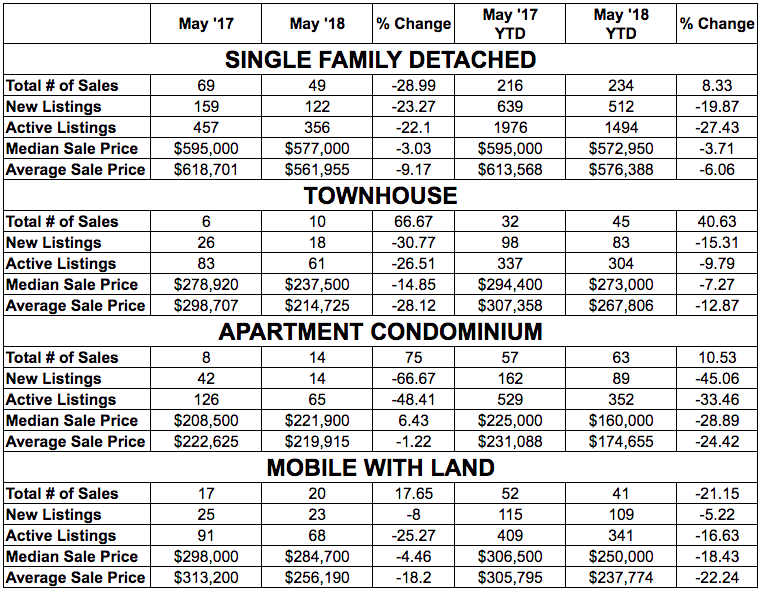 All the values have declined year-to-date but with us seeing a trend of sales increasing, this will help with the market recovery. If this continues, I project that we will see a more balanced market in the next few months to come. It is critical now more than ever to have a professional giving you sound advice when buying or selling, so if you wish to book a free buyer or seller consultation, please give me a call at 780-788- 5421. Barbecue season is here! While many Canadians love to barbecue all year round, this is especially true and more enjoyable when the weather starts to get warm. As with any type of cooking, it's important to follow safe food handling guidelines to make this worthwhile activity safe for the whole family. Buying cold food at the grocery store should be done at the end of your trip to the grocery. Raw meat may contain harmful bacteria and so it is important that it be kept separate from other grocery items to avoid cross-contamination. It’s advisable to bring your own shopping bags or a separate mini cooler for meat products, especially for longer transport times. Always refrigerate perishable foods within one to two hours, especially in warm weather. Store raw meat in the freezer as soon as you return from the grocery store. As for marinating, store marinated meats in sealed containers and put them in the refrigerator. - not on the countertop. Should there be a need to save a portion of the marinade for basting or to be used as a dipping sauce, make sure to set some aside in the refrigerator that hasn't touched uncooked meat. Never use leftover marinade that has been in contact with raw meat on cooked food. Make sure that your cooler is kept cold with ice packs if you are storing meat in it before barbecuing. It’s also important to keep the cooler out of direct sunlight and avoid letting the cold air out by opening it too often. In line with this, you may want to use a separate cooler for beverages. Put the meat in sealed containers to keep any ice water from coming in contact with the meat. This can lead to cross-contamination with others items in the cooler. Pack and wrap meat products separately to keep them away from other food items. Handle raw and cooked meat products with separate utensils, cutting boards and dishes - this is especially important if you also have any type of poultry on the menu. Make it a point to wash your hands carefully with soap and warm water for at least 20 seconds before and after handling raw meat. Most foodborne bacteria are killed by heat. See to it that meats are cooked properly to avoid foodborne illness. Even for professional chefs, color or touch alone is not a reliable indicator that meat is safe to eat. Note that meat can turn brown before all the bacteria are killed, so to make sure that they’re properly cooked and safe to eat, it is ideal to use a digital food thermometer. Check the temperature of the meat by taking it off the grill and placing it in a clean plate. Insert the digital food thermometer through the thickest part of the meat. As for burger patties, the food thermometer should be inserted through the side of the patty, all the way to the middle. Make sure to check each piece of meat or patty because heat can be uneven. Use a clean plate when taking food off the grill. Always remember not to put cooked food on the same plate that held raw meat to prevent cross-contamination. Cool food by using shallow containers, so that it cools quickly. Discard any food that’s been left out for more than two hours. On hot summer days, don't keep food at room temperature for more than one hour. We have shorter summer days so these events with family and friends are very important. Make sure to follow these safety tips to keep your summer memories fun and worry-free.